Muddle that cherimoya--if it's tough going, add that lime juice to help slosh it all along. Add the vodka, Grand Marnier, ice, and shake. 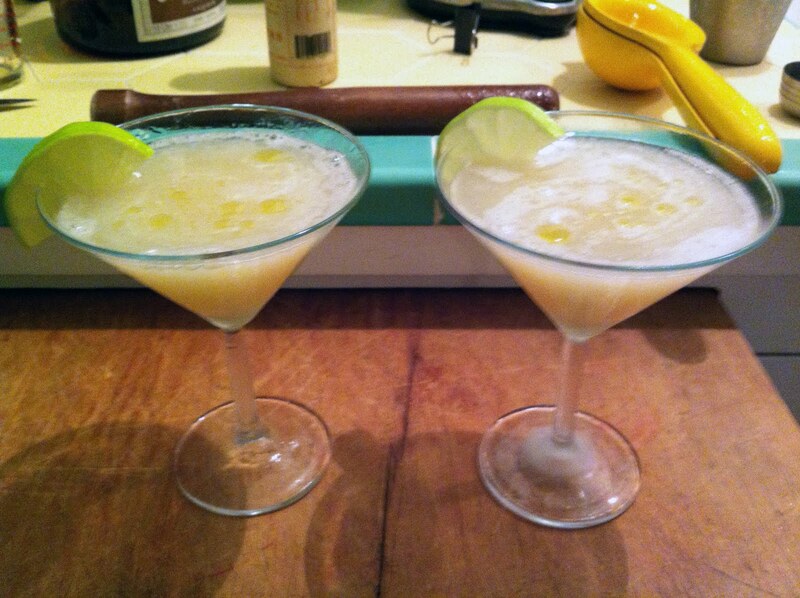 Pour into two chilled up glasses, which will be hard as that cherimoya, even muddled, will clog up the works. Add a couple of dashes of orange bitters per drink; then pour a drop of olive oil atop each--with a knife tip, swirl that across the drink's surface. Add the lime wheels. The olive oil is really for a contrasting texture to the pulpier cherimoya. Here's a drink that leaves you going--is that sweet? sour? can I have another?